There’s no question about it: consumers expect companies to deliver a fast, hassle-free mobile experience. However, the reality is that many mobile sites fall short of those expectations. It makes sense that slow loading time would frustrate your website visitors and affect growth rate and brand perception. But, did you know it leads to increased heart rate and stress levels? Think about the last time you did something stressful, like wait for test results or watch a horror movie – we can all relate. The lag in mobile load times is approximately equivalent to how you felt during these times. As business owners, that’s not the way we want consumers feeling when accessing our content, product, or service. We have five ways to help make your mobile site faster. Those brand or product images could be slowing your website down. Images are often the most significant reason for slow load times, which is because websites usually have so many images. If you compress the images, you could take seconds off your load time. Does your website use responsive design, or do you have a separate mobile design? Experts recommend using responsive designs as the preferred method. In addition, be sure to upload your videos to Youtube before adding them to your site. Often times, including videos in your design slows websites down tremendously. 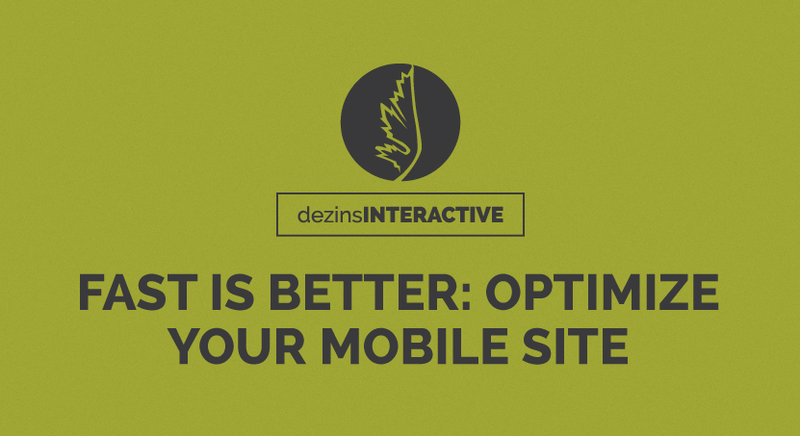 Use this link to learn how to test your website for mobile friendliness. Speed is a vital ingredient of a great mobile website. Mobile users love eye-catching visuals and typically dislike anything that gets in the way of website speed. If you haven’t focused on mobile yet, we encourage you to start today. Want to know more about mobile speed and how it helps to elevate your business? Contact us at info@dezinsinteractive.com.